¨ Do not walk near sheep with dogs during March, April and May when lambing is in progress. 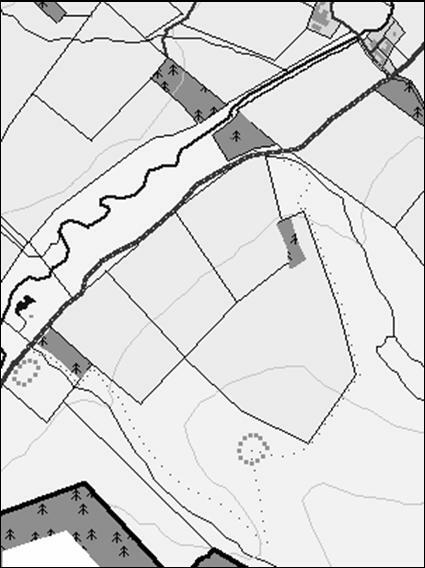 Approximate Total Length: 3¼ Kms Terrain: Moderate - one steepish slope up to the Fort; may be wet in some areas; two stiles both alongside gates so usually suitable for walkers with dogs. From the Centre walk up the road and turn right up the glen (1). After going over the cattle grid (dogs may use the gate), you will pass the Millennium Wood on your right (2). Younger visitors may wish to try their hand at finding the animals here. You can buy an entry map at the Glenholm Centre. Continue on the road for ½km passing the track down to the Holms Water river (3) and the hide overlooking Glenholm pond. Feel free to pop into the hide for a closer look at the wildlife on the pond. Beyond the hide the road crosses a small burn and your route turns left up onto the hill (4) passing the Iron Age settlement ring on your right. Having left the road, your path crosses back over the burn and along the right side of Fiona’s wood. Crossing over the stile (5) waymarking posts lead you initially along the side of the fence and then along the valley side. About 400 metres up this gully the path turns back on itself (6) and a steep track to the left takes you up to the Chester Rig Fort (7). Feel free to explore the fort and enjoy the views before making your way back down to the Centre. The return route runs along the outside of a fence defining two sides of a field which is usually used for sheep, passing marker 20 on the way. At the bottom corner of this field, near the Rookery, the route joins a more clearly defined track which takes you back down to the road. Cross the stile (2) and turn right to return to the Glenholm Centre. You can buy booklets about the wildlife, agriculture and archaeology of the glen, farm and wildlife identification sheets, as well as a range of wildlife related goodies from the Glenholm Shop.